A.K. Moe and his wife, Jackie, of Grafton Floral, for planting the flower beds. They looked beautiful. The Walsh County Museum Board, for the lunch they served. 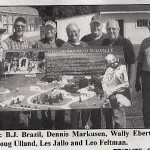 Dennis Markusen and everyone who was involved with the installation of the plaque that was put up in honor of Uncle Sig and Jugville. Matt Hodek and his band for the wonderful old time music. Those people who assisted with the carousel rides for the children. If anyone has been over-looked, please accept this thank you for your help. The efforts of everyone made this a huge success and a wonderful memory for our community. With Dennis Markusen taking the lead on the project and including the members of the historical society as well as the members of the Minto museum and Heritage Village, the ideas were unlimited. 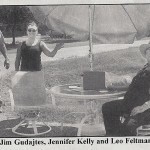 A call also went out in the newspaper for any volunteers that wanted to help with the project. After several meetings, Dennis had compiled a list of projects that needed to be completed, including a large plaque honoring Sig as well as a budget to work with and committee assignments. It was also decided to hold work nights every Wednesday evening for four weeks before the celebration. The projects ranged from earth moving, porch repair, building cleaning and displaying items in the buildings, and could have not been accomplished without the help of our members and volunteers. After a lot of hard work right up to the day before the celebration we were ready! Hopefully we will have nice weather. The day began early that Sunday morning with a lot of preparation and set up for the exciting event. Les Jallo and the crew from Minto were there setting up tables and chairs for the meal, Kurt Kelly was in charge of parking, Chris Misialek was in charge of the raffle tickets as well as getting donations for the band, and BJ Brazil picked up an inflatable game from Grand Forks for the kids, which we set up in the grassy area. A.K. Moe put the finishing touches on a flower bed (a bed frame with flowers inside which was a favorite of Uncle Sigs), a “flower bed” donated by A.K. With the buildings open and Uncle Sig’s old time music playing in several of them, we were close to being ready. It was just about time to get the bib overalls on as a tribute to Sig and open the gates. Admission was free, with a free-will donation for the meal. Traffic was brisk, with nearly 600 people attending…this was great! 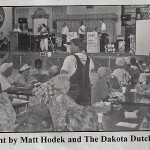 There was music by Matt Hodek and the Dakota Dutchmen, a huge hit with the crowd, and there was dancing by young and old. With Brian James as emcee, the afternoon went along smoothly, with raffle drawings for $100, $200, and $300 throughout the day as well as special memories shared by the people in attendance about their experiences with Uncle Sig. Other events during the day were merry-go-round rides, the Castle air jumper for kids, tours of the village and Jugville, a dedication of the plaque honoring Sig Jagielski, and a raffle drawing for a four-volume set of Walsh County Heritage books. The picnic lunch was absolutely the best, and for dessert we had the Schwan’s truck. What a great day this was, great weather, great food, and great people to share it all with. What more could you ask for? A celebration like this would not be possible had it not been for all of the people who gave their time to this. However, at the risk of forgetting someone (and I would), I have decided not to do the list, but to say THANK YOU to any and all who had anything to do with this great event. With the closing of the village for the winter months and re-opening April 1, 2011, it seemed to have given everyone lots of time to think about fundraisers for the remainder of 2011, as we were busy. We started out with a fish fry on April 15 and again on June 12; SummerFest at the end of June; a fish fry on August 5; “A Tribute to Uncle Sig” on Sunday, Augusts 14; a fish fry on September 16; a retirement party for UPS driver Pat Svoboda on September 25; a pancake and sausage breakfast on October 2; a fish fry on October 21, and ending the season (due to such wonderful weather) on November 18 with a fish fry. Even with the village being closed until April 1, 2012, the weather was so nice the Grafton Volunteer Fire Department held their Christmas party at the Village on December 10 and Chris Larson, along with the chamber of commerce, held a teen dance at the Village on December 30 with about 60 kids in attendance, and all had a good time. Harold Blanchard and Gordon Bracken were involved in tours with the school kids to include Upper Valley Pre-School teachers and students and other groups who had scheduled tours to view the buildings. Walsh County Historical Society and Heritage Village members and volunteers, under the direction of Dennis Markusen, spent endless hours cleaning out the buildings, rearranging many items in and around Jugville, worked on draining water from pot holes and haling dirt to fill those low spots, then pouring a concrete slab to house the “entering” Jugville sign. Dennis provided us with an antique bed frame that A.K. Moe filled with flowers that he so generously donated all in preparation for “A Tribute to Uncle Sig” that was held at the Village on Sunday, August 24, 2011. This was a huge success, with upwards of 600 people in attendance. Sarsaparilla was sold in the Main Street Saloon and in Uncle Sig’s Saloon. Merry-go-round rides for the children were sponsored by Wally’s Supermarket, First United Bank and Insurance, and Wells Fargo Bank. The Schwann’s ice cream truck was on site with many treats available for purchase. Music was provided by Matt Hodek and the Dakota Dutchmen. Raffle drawings were held throughout the day. 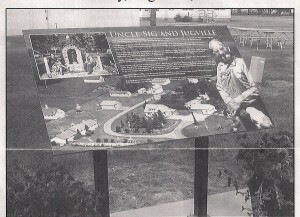 A “Free-will offering” picnic lunch was served and dedication of a plaque honoring “Uncle Sig” was held. The buildings were open for everyone’s viewing pleasure. Thank you for the many other sponsors and donators who made this celebration a success. A BIG thank you to Dennis Markusen, Chris Misialek, and all the historical members, Heritage Village members and any other volunteers who helped to make this a success. A.K. Moe, the chamber of commerce and businesses held a retirement party at the Village on Sunday, September 25, 2011, for Pat Svoboda’s 30-plus years of service to the Grafton community. Lunch was served and lots of well wishers were on hand to wish Pat well on his retirement. He will be missed by everyone who knew him. Thank you to all who made this celebration a success. Heritage Village, at their January 2012 board meeting, reviewed the year’s financial statement and very sadly made a decision to discontinue fundraisers. For all the hard work put into them by all, the increasing cost of groceries and supplies, a limited work crew, and the net profit from the fundraisers just does not warrant continuing them. We may run an occasional fundraiser and will continue to do something for SummerFest at the end of June and By Gone Days in the fall. With this in mind, we hope to be able to continue with the support of donations, grants, rents, mill levy, etc. Any donations and volunteers would be most grateful for upcoming repairs needed at the village in 2012. It is our plan this year to have the buildings at Heritage Village open for your viewing pleasure on Sundays beginning with Memorial Day weekend and ending with Labor Day weekend from 1 pm until 4 pm or other days by appointment by calling 701-520-1273, 701-360-4096, or 701-520-1207. Current board members at the village are: Dr. Harold Blanchard, president; Ken Hoffmann, vice president; Gordon Bracken, secretary; and Verna Sherek, office manager/treasurer. Board of Directors are Norman Paulson, Marlene Paulson, Vernon Russum, Carol Spale, Kathy Nomeland, and member at large, Greg Amb from the Developmental Center ISLA. We are in need of about four new members, so if anyone is interested, please contact us by calling Harold at 701-520-1273, Ken at 701-360-4096, or Verna at 701-520-1207. Our theatre building is always for rent for rummage sales, showers, family reunions, graduations, or whatever you may wish. No alcohol. To rent the hall without the kitchen is $50 per event, and with the kitchen it is $75 per event. You may call the above numbers to reserve a date or to find out more information. Remember! We are always looking for VOLUNTEERS. Heritage Village wants to thank everyone who participated in any way to carry out this year’s activities and to all those who gave donations. 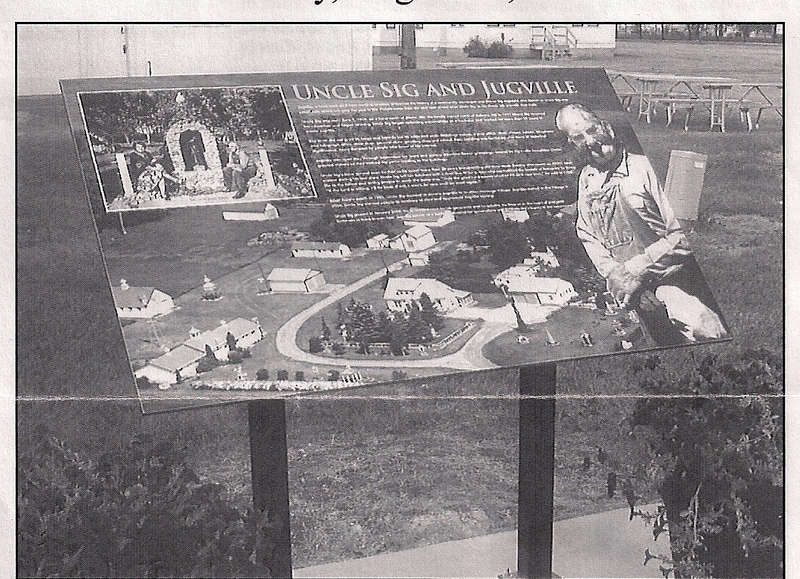 Continued support from the community and individuals is needed to continue the preservation of Heritage Village and Jugville. Historic Elmwood is the elegant Victorian mansion located on 20 acres of the Park River in Grafton, North Dakota. It has been undergoing extensive restoration since it was gifted first to North Dakota Parks and Recreation in 1986, and later transferred to the Grafton Park District in 2007. This transfer “in title only” enables the Elmwood Board to continue the preservation of this property and the history and memories of its occupants, and provides the community with a gathering space to socially enjoy the home and grounds. The major restoration of the interior has, for the most part, been completed, and ongoing repair and maintenance is now required. 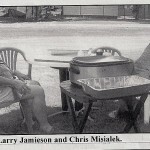 In 1992, Pastorek Construction with Stanley Langowski as carpenter rebuilt in the front porch and Jarl Pedersen painted the house. In September of 1997, Larry Vovrovsky painted the entire house. In 1999, Ray Misialek repainted the basement brick, and Pastorek Construction removed the window wells, shingled the roof, and updated the gutters. In 2002 there was extensive cleanup of the yard. Trees were removed, the riverbank was cleaned up, the carport was removed, and a flower bed was planted on the northeast corner. This work has continued with more flowers and trees planted. In 2003 Don and Laura Manney scraped, spot primed and painted the house. They took apart, cleaned, and removed old paint on 38 windows. In 2004 water damage on the front porch required the replacement of many boards. Gutters were added to avoid future problems. 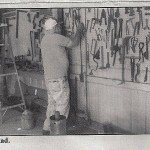 Stanley Langowski was the carpenter and Don and Laura Manney were the painters. In 2007 B&D Flooring installed a new kitchen floor, and the cost of utilities was added to the budget. In December 2008 Lewis Johnson replaced the large east window in the living room. In January 2009 intense cold caused the furnace to quit, and repairs were necessary in the kitchen and bathroom to replace pipes and repair a ceiling. Lewis Johnson replaced the large south window in the living room. Kurtz & O’Brien installed a new furnace in April. The east side of the house was painted in 2010, and the west side in 2011 by Signature Painters. This involved stripping off the old paint, replacing old boards, and priming and painting with two coats of paint, replacing old boards and priming and painting with two coats of paint that would last 15 years. The front of the house that includes a lower and upper porch and the back of the house remain to be painted in 2012. The community has been very supportive of Elmwood. It is used for meetings, parties, anniversaries, weddings, class reunions and other celebrations. Friends of the Elmwood Board and others are always willing to help. It can be a lot of fun (and work) to decorate a Victorian house at Christmas. The repair, maintenance and restoration needed require funds. The utilities alone are about $2,500 a year. Fundraising is a major part of maintaining Elmwood. The house is rented. Donations, memorials and grants are accepted, and the Elmwood Board sponsors three events. A rhubarb festival is held each June at the time of SummerFest in Grafton; a spaghetti supper is held on Election Day in November to acknowledge C.A.M. Spencer’s election as attorney general in 1890; and for the past seven years a very successful house tour has been held in December. Members of the Elmwood Board are Michael Walski, Loretta Moe, Judy Evens, Eleanor Iverson, Bonnie Mohagen, Jeanne Monson, Mary Jo Olson, Gloria Thompson, Ina Raumin, and Beth Rose. The Walsh County Historical Society has made a grand entrance into the computer age this year with the creation of a new website. This site offers all the information you might want about the society. The home page outlines the historical society and includes photos and links to the pages for the Walsh County Historical Museum in Minto and Heritage Village in Grafton. 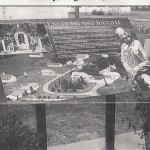 These include slide shows of the historical sites, information on location and hours of operation, and a calendar of events, as well as listings of board members and contact information. 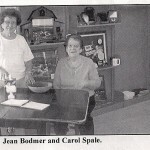 Another page contains the most recent Walsh County Historical Society Newsletter, with photos of evens and sites. There is also a page dedicated to the four-volume Walsh Heritage biography books. We are presently working with the LDS Historical Library in Salt Lake City, Utah, which has agreed to digitize our historical publication at no cost to us so that we can connect it to our website. This exciting project will make it possible for anyone with a computer to access the information in the Walsh Heritage books. These books should be available on the website within the next few months. Finally, there is a page dedicated to preserving additional family histories of Walsh County. Though limited financial resources have created the condition where the printing of another volume of Walsh Heritage is not an option at this time, this website offers a space dedicated specifically to newly-submitted family biographies of Walsh County residents. If you would like to add your family history or community history to this engaging Walsh County genealogy project, please contact Mary Kovarik, Genealogy Chairman and Webmaster, at 701-284-6828 for more information. And be sure to visit our new website at www.walshhistory.org. The Walsh County Historical Museum was involved in a variety of events and projects in 2011. We began the year with our usual school tours during the month of May. Students from area schools once again enjoyed “going back in time” and exploring what the museum has to offer. 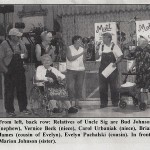 In August, we had the pleasure of cooking and serving the food for “Uncle Sig Day” at Heritage Village in Grafton. It was a fun-filled afternoon and we were happy to be a part of the festivities. Our annual chili feed was held in November. This is one of our main fundraisers each year. A new telephone was purchased for the museum complete with an answering machine and a recording of the days and times that the museum is open. A very important project this past year was having new brochures designed and printed. Make sure that you check this brochure out! It has up-to-date pictures and all the information needed to contact and visit the museum. Also, if you are driving through Minto, you will notice a new Walsh County Historical Museum sign that was donated on behalf of the Minto Action League. A project that is in the works for this summer is the installation of new florescent lighting in the antique car area of the museum. Keep your calendar open for Museum Alive, which will be held the last Sunday in June of 2013. The museum will be open every Sunday this summer beginning memorial weekend. We look forward to many visitors stopping by. The Walsh County Gun Club is s till located 10 miles west of Grafton, North Dakota. It is tucked away in a scenic setting next to the south branch of the Park River just off Highway 18 going north to Cavalier. The club is open 5 months a year from April through August. Shooting is every Tuesday and Wednesday from 6:30 pm until dark. There is also shooting on some select Sundays. Practice shooting is available to nonmembers during open hours. The club hosts a registered shoot around the Fourth of July each summer with over 100 participants from North Dakota, Minnesota, and Canada. There are nine events of 100 targets each over three days. This includes events in singles, handicap and doubles. This mid-summer shoot ranks as the second or third largest registered shoot in North Dakota each year. The club has hosted the state Roughrider Shoot on two occasions. I started shooting trap in the mid 70s when a group of friends asked if I wanted to get on a team with them in Grand Forks. I asked, “Why Grand Forks,” and they told me that it was a bigger and better club. We could never get together in Grand Forks that year, so the next year we went to Walsh County. Walsh County then had four handset traps, poor sidewalks, and functioned out of the east end of the old Walsh County Curling Club. The floor was bad, and the roof leaked. There were five or six teams. Harvey Momerak was the secretary, doing a good job. Today, the Walsh County Gun Club is one of the biggest and best clubs in North Dakota. Fred Clark became the next secretary of the gun club, and through his leadership the gun club grew. 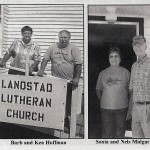 Jerry Blanchard and Mike Kirkeby followed Fred as secretary, with Angie Magnusson serving as the current secretary. 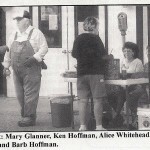 The Walsh County Gun Club was provided as the current secretary. The Walsh County Gun Club has provided the North Dakota Trap Shooting Association with good leadership. Don Loos was president in 1958 and 1959. Fred Clark was secretary in 1984 and president in 1986 and 1987. Bill Suda was president in 2006, 2007, and 2008. The Walsh County Gun Club now has seven trap fields, all equipped with automated setting, and voice-activated pulling. There are three modern buildings on the grounds for storage and socializing. This includes air conditioning and a fully equipped kitchen. There is a campground with electric hookups for 20 campers. Last year’s season saw 26 teams of five shooters spread out over four leagues. Some individuals shoot on more than one team. There was also a double league and a handicap league for interested shooters. Numerous Walsh County members have been North Dakota State Champions. Don Loos was the men’s singles champion in 1958 and 1960. Dorothy Loos was the female singles champion in 1967. Jerry Blanchard was the men’s singles champion in 1986. Don Loos was the handicap champion in 1952. Jim Tallackson was the handicap champion in 1992. Joey Thompson was the sub-junior champion in 1989. Any Suda was the sub-junior champion in 1990 and 1991. Brady Phelps was the sub-junior champion in 2000. Andy Suda was the junior champion in 1992, 1993, and 1994. Members of the Walsh County Gun Club who have received special recognition include the Bill Fischer sportsmanship trophy to Dorothy Loos 1958, Art Tallackson 1963, Don Loos 1964, and Fred Clark 1984. Dorothy Loos was inducted into the Hall of Honor in 1983. Don Loos was inducted into the Hall of Fame in 1971. Fred Clark was inducted into the hall of Fame in 1993. The club currently has a very strong youth program. The money comes from numerous fundraisers. The program includes instructions for new shooters, a summer youth league, and taking teams, expense free, to the state shoot. This includes registration, transportation, shells and overnight lodging. Special recognition goes to Andy Suda, Joey Thompson, Dawn Hove, Shawn Clark, and Mark Torkelson. During their junior team competition they shot a perfect squad each, getting 25 straight. The current members of the gun club certainly extend our appreciation to those who donated the land and invested their money years ago. Their vision has created the opportunity for all of us to enjoy the sport of trap shooting in Walsh County. New shooters are always welcome and teams are available.